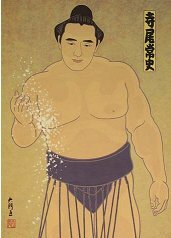 One day in July 1979, a young boy named Yoshifumi Fukuzono made his debut in professionnal sumo. Born in a rikishi family, he would achieve a brilliant career under the shikona of Terao. 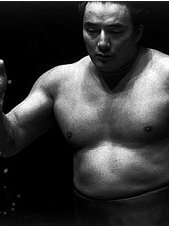 When he retired in September 2002, it was one of sumo’s most charismatic stars who hung up his mawashi. He then became oyakata, under the shikona of Shikoroyama. He first started by being the assistant to his brother, Izutsu oyakata (former Sekiwake Sakahoko). But nobody expected him to remain in the shadow for a long time. And, indeed, he created his own heya, the Shikoroyama beya, in January 2004. To achieve this, he didn’t use any transfer of rikishi from the Izutsu beya, as it is usual to do. On the contrary, he preferred calling new recruits only. This is typical of the will of the 41 year old oyakata to create his own heya, with rikishi fully produced by him. From January to July 2004, no less than six young rikishi were recruited by Shikoroyama, certainly making his heya the most active one in 2004 as far as recruitment is concerned. It is often said that the young men who want to become rikishi choose their heya according to what kind of rikishi the oyakata has been during his career. And it seems that is true for the young members of the Shikoroyama beya. Indeed, all six are rather light (the most heavy of them weighs only 129 kg), as was Terao (116 kg during his career). Time will tell if they have the talent of their master, and if they are able to show the typical perseverance of the Izutsu beya wrestlers.